Temperament: The Beagle is sweet, gentle lively dog that loves everyone they meet. They are very sociable, brave and intelligent. Family Dog: The Beagle is excellent with children. They are typically good with other dogs but not always good with other small pets due to their natural hunting instincts. Shedding: The Beagle is an average shedder. Grooming: The Beagle should be brushed occasionally with a firm bristle brush and bathed only when necessary. Their coat can be cleaned with a dry shampoo occasionally. Their ears should be checked regularly for signs of infection. Training: Beagles require firm and patient training. 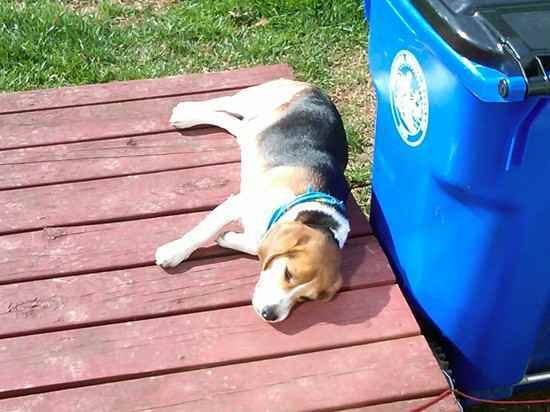 Behavior: Beagles are stubborn and have a mind of their own. It is very important you establish yourself as the pack leader and give them lots of mental and physical exercise every day. Barking: Beagles do like to bark and have a loud baying cry used when hunting. Exercise: The Beagle is an extremely energetic breed that needs a daily walk and plenty of exercise every day. Beagle should always be on a leash or in a safe fenced in area when outside as they love to follow their nose anywhere it will take them. Living Conditions: The Beagle can do alright as an apartment dog provided they get plenty of daily exercise but keep in mind they love to bark. They can be very active inside and should have a fenced yard. Appearance: The Beagle is a hardy, sturdy built hound with a short, sleek coat which can come in any hound color. Size: The Beagle has two distinct height classifications 13 to 15 inches and under 13 inches. The average weight of a Beagle is 20 to 25 pounds. Head: The Beagle's skull is relatively long and slightly domed. Eyes: A Beagle's eyes are large and set well apart from each other. They should be brown or hazel in color. Beagles have a soft, gentle expression. Ears: The Beagle has large, broad, long ears that hang close to their head. Their ears are set relatively low on their head compared to other breeds. The front edge of their ears makes a slight turn inward toward the cheek and the tip is rounded. A Beagle's ears are soft and fine to the touch. Muzzle: A Beagle's muzzle is medium length, straight and relatively square in shape. Beagles have large and open nostrils which are good for hunting and tracking. Neck: A Beagle's neck should be of medium length, strong and rise free and light from their shoulders. Their throat should not have any folds of skin except for a slight wrinkle just below the angle of the jaw. Body: A Beagle should have strong, sloping shoulders. Beagles have a deep, broad chest. Their back should be short, muscular and strong. Forequarters: A Beagle should have short, straight forelegs. Hindquarters: The hips and thighs of a Beagle should be strong and well muscled, giving them their propelling power. Feet: The feet of a Beagle should be round and firm with full, hard pads. Tail: The tail of a Beagle short when compared to the overall size of the dog and should be set moderately high and carried happily. Their tail should not be bent forward over their back, but can have a slight curve to it. Color: Any true hound color. Coat: A Beagle's coat should be close, firm and of medium length. Life Expectancy: The Beagle has an average life expectancy of 12 to 15 years. Health: The Beagle can be prone to heart disease, epilepsy, chondroplasia (dwarfism), eye and back issues. Litter Size: The Beagle has an average litter size of 2 to 14 pups. History: The Beagle most likely began as a cross between the Harrier and other English hounds. They have been used for hunting small game, detecting narcotics and as family pets. This breed has commonly been used in medical experiments throughout history.